Keynote speaker at Hawaii Climate Conference cites importance of equitability in how we respond to the effects of a warming planet. Hawaii needs to have a “serious, adult, public conversation” about climate change as part of its effort to actually move the ball forward to combat the worst effects of a warming planet, Beverly Scott, a nationally recognized expert in transit and sustainable infrastructure, said Monday. Delivering the keynote address at the inaugural Hawaii Climate Conference, Scott said the Aloha State has the right goals — carbon neutrality, 100 percent renewable energy, a clean transportation sector. But “they fly in the face of your current reality,” she told the audience of about 200 people at the East-West Center in Manoa. 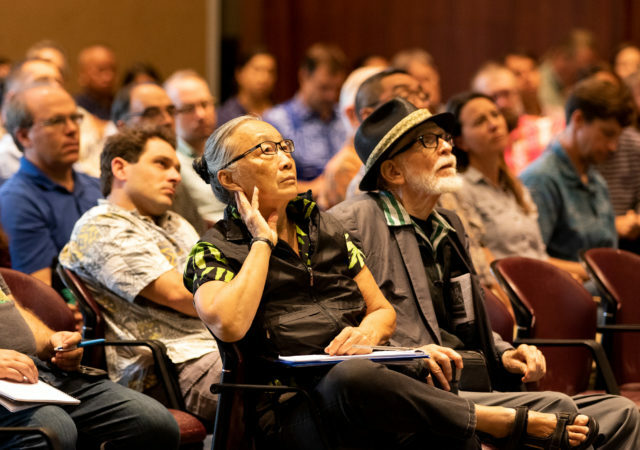 Hawaii should focus on creating new, more flexible business models that include public, private and nonprofit partnerships, she said, and lay the groundwork with transit-friendly land use and zoning laws. About 200 people attended the inaugural Hawaii Climate Conference, an all-day event Monday at the East-West Center in Manoa. “We have got to break down some of this bureaucracy,” Scott said, adding that’s where the public can get involved in advocating for what they want to see happen. Critical to any action on climate change, however, is ensuring Hawaii builds equitability along with resiliency, she said. 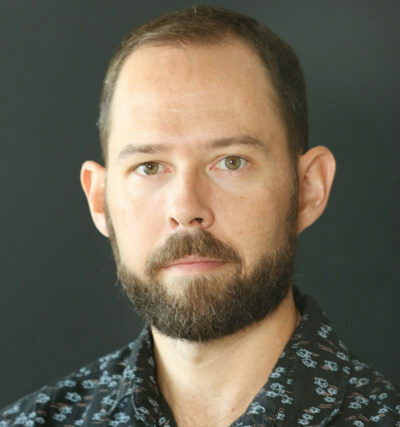 “The causes of global warming and climate change have helped to create, support and perpetuate many of the societal inequalities that exist today,” sometimes at the expense of Native Hawaiian and Micronesian communities, Scott said. That’s too often downplayed or discussed behind closed doors, she said, adding that public support can be generated through education and communication. “We don’t want to look in the mirror and see that all of us collectively created this,” Scott said. Looking within and recognizing how we go to this point, she said, is essential to navigating our way out. “This is an all-out, all-in war,” Scott said, drawing applause from the crowd. Hawaii Department of Land and Natural Resources Director Suzanne Case, left, and Gov. 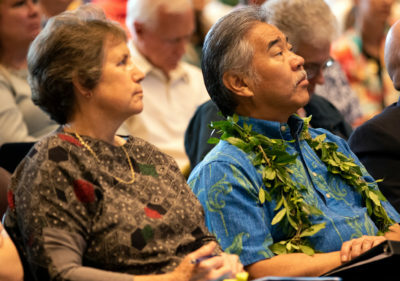 David Ige listen to a report on the national climate assessment during the conference. Hawaii is doing more than many states, but is also far more vulnerable as an archipelago in the middle of the Pacific. Democratic Gov. David Ige said he was proud of Hawaii for being the first state to commit to decarbonizing its economy, and for its efforts to save vital watersheds. The governor and other speakers said it’s more important than ever for states and cities to step up in light of the federal government’s failed leadership on climate change under Republican President Donald Trump. But time is of the essence, he said. 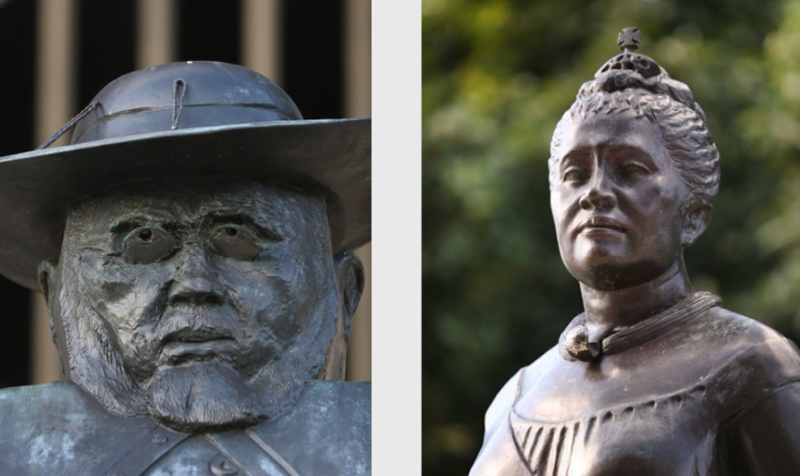 “Our science tells us the window is closing fast for the most meaningful action,” Ige said. 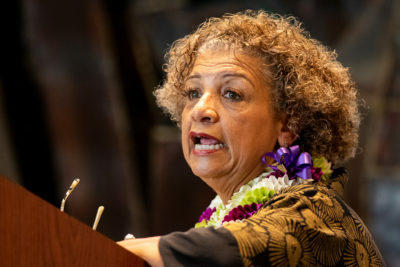 Beverly Scott, keynote speaker at the inaugural Hawaii Climate Conference, highlighted the interconnectedness of climate change and equity. Hawaii Department of Land and Natural Resources Director Suzanne Case, who co-chairs the state climate commission that put on the conference, said the Legislature has been supportive of efforts to address the threats of global warming. But she said more funding will be sought next legislative session, which opens Wednesday, so the work can continue. The commission’s primary focus is currently reducing emissions in ground transportation and implementing the comprehensive sea level rise report it adopted last year. Despite the grim picture, Scott said she has only felt inspired to rise up. She laid blame on her generation — the baby boomers — for being mostly responsible for creating such a mess. 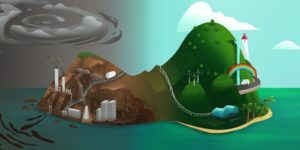 Editor’s Note: This year, we’re putting an intense spotlight on climate change — how it’s affecting Hawaii now and what the future may look like for all of us in the islands. 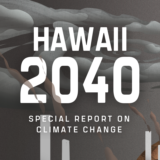 We’re calling our project Hawaii 2040 because that’s when the most recent studies say we’ll feel the worst effects of climate change. That’s much sooner than scientists originally thought. Now the big question is — what are we going to do about it. How can we all change our behavior to help out? What new policies can our political leaders put in place to change things fast enough to matter? How will we adapt? Over the coming year, we want to bring you — our readers — inside the discussion in a very up close and personal way. Besides an ongoing series of stories, video, podcasts and other multimedia reports, we want you to join us in figuring out potential solutions. We’ll be visiting communities and neighborhoods throughout Oahu to talk about how these issues are affecting you personally and what you think should be done. Together we can make our voices heard. Tell us how you’re being affected by our changing climate. What do you think should be done?